Macau-based casino operator Galaxy Entertainment Group Ltd announced on Wednesday a partnership with Industrial and Commercial Bank of China (Macau) Ltd – also known as ICBC (Macau) – and WeChat to accept contactless mobile payments throughout its properties. As part of the partnership, the WeChat Pay mobile payment platform will be made available at Galaxy Macau, Broadway Macau and StarWorld Hotel, stated a press release issued jointly by the gaming operator and ICBC (Macau). The partnership “answers the needs of mainland Chinese visitors to Macau, who overwhelmingly prefer to pay with e-wallets such as WeChat Pay,” stated the release. “Guests can now pay with WeChat Pay at a wide range of establishments, with a total of 136 outlets launching the service in phases,” the document added. These include hotels, food and beverage outlets, shops and entertainment-related venues located inside the Galaxy Entertainment properties. 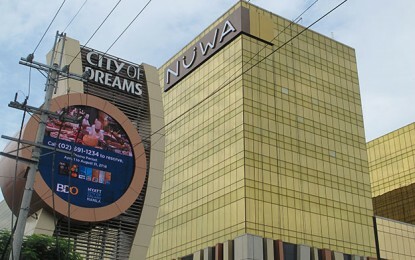 Chinese visitors are viewed as a vital target group for Macau’s casino sector, according to several investment analysts covering the gaming sector. WeChat Pay’s payment system would not be available in the casinos inside the Galaxy Entertainment properties, a company spokesperson told GGRAsia. According to the release, Galaxy Entertainment is the first hospitality and entertainment group in Macau to accept WeChat Pay. 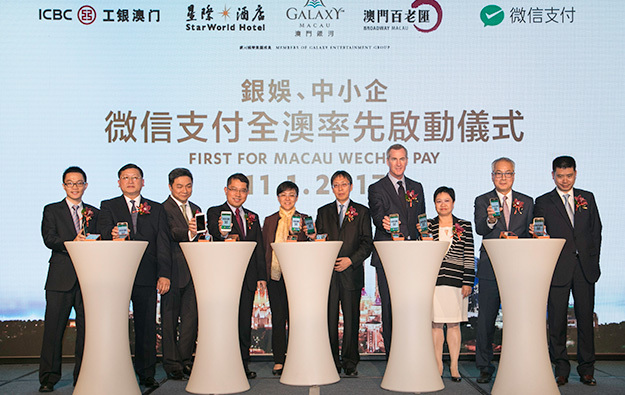 “By launching WeChat Pay across the Galaxy Entertainment properties, we are providing an exclusive opportunity for Macau’s valued mainland China visitors to use a preferred payment method for their comfort, security and convenience,” the firm’s senior director of international premium and mass market development, Raymond Yap Yin Min (pictured, second left), said in comments included in Wednesday’s press release. Tencent Holdings Ltd-backed WeChat Pay is an in-app payment feature that allows users of social network platform WeChat to make contactless mobile payments inside and outside mainland China. 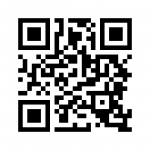 It is considered one of China’s largest mobile payment platforms. Marketed as Weixin in mainland China, WeChat had 963 million monthly active users as of June 30, according to Tencent Holdings.